Motorcycle riders are seen on a flyover on EDSA yesterday during a unity ride against the Motorcycle Crime Prevention law. 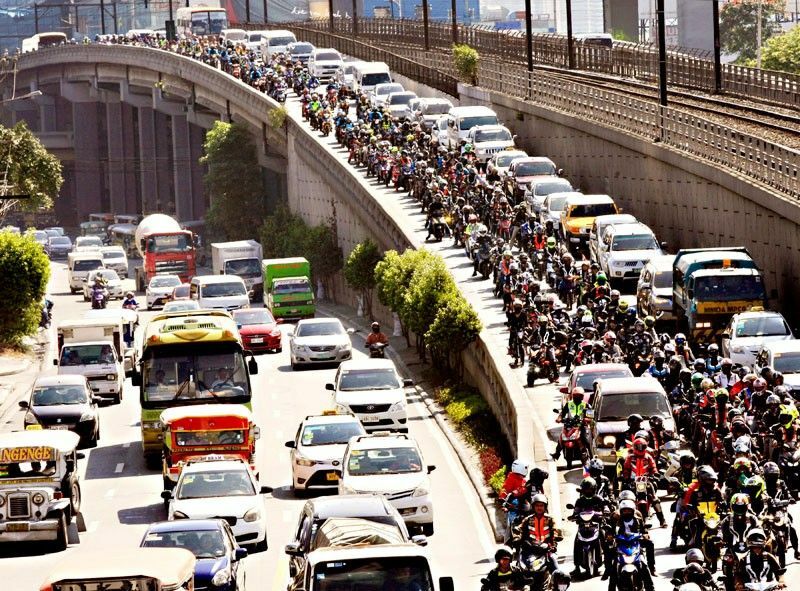 MANILA, Philippines — At least 10,000 motorcycle riders joined a so-called unity ride yesterday along EDSA in protest against the new motorcycle law. They rode to White Plains Avenue at the corner of EDSA to demonstrate their protest against Republic Act 11235 or the Motorcycle Crime Prevention Law that mandates double plates for two-wheeled vehicles. George Royeca, Angkas head for regulatory affairs, said they are supporting the safe use of motorcycles. He noted that while they are not against the law per se, they are not in favor of the provision that requires large metal license plates for motorcycle, as this will endanger the lives of motorists, commuters and pedestrians. “We support the safe use and operation of motorcycles, that has been our advocacy from the beginning,” he said in a text message. Land Transportation Office (LTO) chief Edgar Galvante earlier said they are open to suggestions from the public in crafting the implementing rules and regulations (IRR) in accordance with what is written in the law. Under RA 11235, the LTO is mandated to issue bigger number plates for motorcycles to make it readable from a distance of at least 15 meters. It was also ordered to devise a color scheme for the plate numbers for every region for easier identification where the motorcycle was registered. Sen. Richard Gordon, author and sponsor of the law, asked the LTO to make sure that the law will not be watered down in the IRR it is crafting and that the IRR should not digress from the law’s purpose, which is to protect the citizenry from crimes committed with the use of motorcycles. “The government is now taking action against riding-in-tandem crimes with the enactment of this law. We should not let this law die because of poor implementation that is why the LTO should do the IRR properly. The IRR is not lawmaking. It is just an explanation of how the law will be implemented,” he pointed out. Gordon intends to propose a meeting with the LTO so they will get the purpose of the law correctly in writing the IRR. Last week, reelectionist Sen. Joseph Victor Ejercito, an avid motorcycle rider, organized a dialogue between the LTO and riders’ groups to help resolve issues and reassure the latter that their riding safety will be taken into account. Ejercito noted that the law angered riders because of the supposed imposition of the two metal plates (front and rear) requirement, which they claimed posed a serious threat to their safety. He said the LTO agreed to study proposals that allow the use of stickers or RFID panels instead of metal plates in the motorcycles’ front. He also thinks of proposing amendments to the law, specifically on the P50,000 penalty and imprisonment. Violators of RA 11235 could be slapped a penalty of prision correccional (six months and one day to six years of imprisonment) or a fine of not less than P50,000 but not more than P100,000 or both. If the motorcycle was used to commit a crime that constitutes a grave felony under the Revised Penal Code or to escape from the scene of a crime, the owner, driver, backrider or passenger will be slapped with reclusion temporal (a jail term that lasts for 12 years and one day to 20 years) to reclusion perpetua (imprisonment for 20 years and a day to 30 years).